Hey there! My name's Dean and for the last few years I've had a blast drawing characters for my blog Springfield Punx. I'm often asked questions about the process I use to make them though; How do you make your lines so smooth? Do you use a scanner? A graphics tablet? What software do make these with? Well as a response to those questions, I thought I'd provide a look at how I make these bright, crisp-looking characters for not only Springfield Punx, but many other cartoony (and non-cartoony) projects as well. Follow along with me and we'll look at ways you can make your characters as bright and bold as anything you'll see on The Simpsons or Family Guy. It's certainly not the only way to do things, it's simply the method I enjoy using. Thank you for taking the time to read! Now let's get into it! Now I usually start with a good old pencil and paper, getting a drawing I'm satisfied with, and then scanning it onto my computer. I like the 'old-school' feel and comfort of pencil & paper for this stage of things, but it's your call. If you're confident enough and want to draw completely on the computer with your graphics tablet, you could skip the pencil drawing and scanning of course. In this demonstration, I've done a "pouncing ninja" to work with. For your pencil drawing, minor mistakes or a extra lines don't matter too much, as you're going to fine tune your drawing later anyway. Don't overly rush your pencil drawing though, take enough time to get something good that you're happy with. It's going to be the foundation for your finished image after all! As well, if I'm doing a caricature of a celebrity or I need reference for a costume, I'll often hit the net for a bunch of images of my subject and paste them all onto one page in a graphics program; almost like a collage that I can always refer back to for my sketch. So now I have a sketch I like and I'll scan it to work with it on my computer. You probably don't need to scan any higher than 300 dpi resolution, but occasionally I do want to go even higher. As far as a scanner, you probably don't need anything overly fancy. I'm working with a Canon Pixma MP150, which does the job just fine if I do say so. Save in BMP format if you need a higher quality image, but JPG format is usually perfectly okay for this sort of thing (and it takes a lot less hard drive space). In the next step we'll want to trace our scanned sketch, however it might first be necessary for you to use your graphics program, such as Photoshop, Paintshop Pro (or whatever you use) to adjust it's brightness and contrast so as to have an image that's easier to work with. Once we're happy with it, we can get down to tracing our sketch. For the tracing and coloring, I love doing these characters as "vector graphics". What are "vector graphics"? If you haven't heard of "vector graphics" before, they could be described as graphics made of mathematical shapes, lines and colors making up something like a 'geometric formula' for an image. Instead of an image made of a set sequence of pixels (raster graphics), the program can apply this 'geometric formula' to 'redraw' the image - crisp and smooth - at any size. There are a number of powerful programs out there suited for vector graphics. I do like the widely acclaimed standard-setter Adobe Illustrator on account of it's sheer amount of powerful (and useful) features and options, but I also like Macromedia (now Adobe) Flash, as I find it simple & fun to use and initially a bit more intuitive. Flash is not only for animation after all! When doing cartoony characters such as those for Springfield Punx, it's certainly my favorite. For me, simplicity is the key to enjoyable cartooning. I'll be using Flash for this demonstration. (Adobe Illustrator's method for cutting out and selecting portions of a shape is a bit 'advanced' for me, but your mileage may vary.) You can follow these steps in other programs, you'll just have to 'translate' it for however your program works. Even in non-vector based programs, these steps can usually be replicated well at high resolutions. Don't worry, it's not too hard. So now we import the sketch, lock that layer it's on, and then create a new layer on top to trace on. Using the pencil tool (on 'smooth' setting), we'll go all around the image and make our outlines. Select any lines and apply the smooth tool for more smoothing if needed. Now, you can use a mouse to draw your lines, but if you've ever tried, it's not a lot fun. It's really like trying to draw with a block of wood! I love drawing with my Wacom Intuos4 graphics tablet instead. Drawing with the mouse can be rather awkward and tedious, and often a drudgery. The repetitive strain it can place on the fingers, wrist, and elbow make things even more annoying. In fact, I often credit my graphics tablet with saving my arm from serious harm. Using the tablet is way more natural feeling and allows things to remain fun, and that's half the battle right there. So let's trace using a color that shows up well against your sketch - red for example. It's much easier when you can see your lines clearly. Be sure to 'lock' your lines together without any 'leaks' so you can fill them with colors next. I like doing it all a bite at a time, making progress on each part, not feeling I need to tackle it all in one go. I'll trace one part, select all the lines from that part, 'group' them (Ctrl+G) and go on to the next. Once you've traced the whole character, you now have your 'ghost' outline. Copy that and paste a new one beside it. (Save your progress often BTW). From this copy, you take each piece, 'ungroup' it, (Ctrl+B) and fill it with some vivid & fresh 'block colors'. After a certain piece is filled, (be sure the lines are set to a consistent thickness that you like, adjust if needed) Change your lines to black, select and then convert them to shapes - Modify->Shape->Convert Lines to Fills. Note - If the software has a problem when converting them to shapes (ie. they look messed up or some lines disappear) try selecting fewer lines at a time and then convert them. This next step isn't necessary, but I prefer the way it makes the finished image look - I zoom in and find all the 'ends' of the black lines, I grab the edge of those line shapes and I pull them to a point. I just find it makes everything look less flat. Now we'll do some highlights and shadows. We'll use the pencil tool again, creating guides or 'borders' to mark off where the highlights and shadows will go. 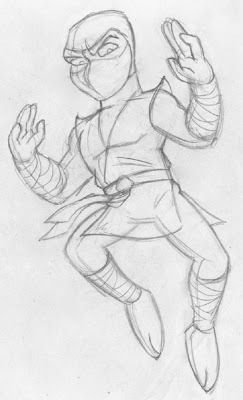 We'll just follow the basic contour of the ninja's body to block out some highlighted and shadowed sections. (Again, select and 'smooth' a line if necessary). Then fill the sections with a lighter shade & darker shade, in a way that will give him some three-dimensionality. If you were doing this as a non-vector image in Photoshop (or similar program), you'd likely use the 'lasso' selection tool to make a selection and fill that section with the colors you want. When you're done adding highlights and shadows, 'group' everything together. Now you almost have a finished character! 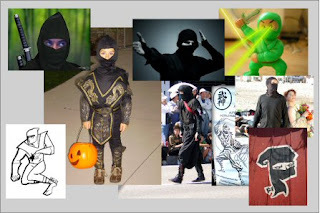 At this point we can give our ninja that true 'finished' look by framing him with a thicker black outline. It'll make him look great, you'll see... We copy the whole character and paste him next to the other. Ungroup everything and change the colors to all black, ending up with a silhouette of the character. Select that silhouette and expand it outwords a bit - Modify->Shape->Expand Fill. Now 'group' that silhouette and move it back behind your character (Modify->Arrange->Send to Back) and see if you're happy with the thickness of the surrounding black outline, otherwise you can just undo to where you were and give a different 'Expand Fill' amount. That frames him nicely, doesn't it? Throw a cool background behind him, and voila! Or instead of creating a background, export your character alone (in a high-resolution) to a '.png' format and by default your character will have a transparent background. You can then import him into other graphics programs to play with there. 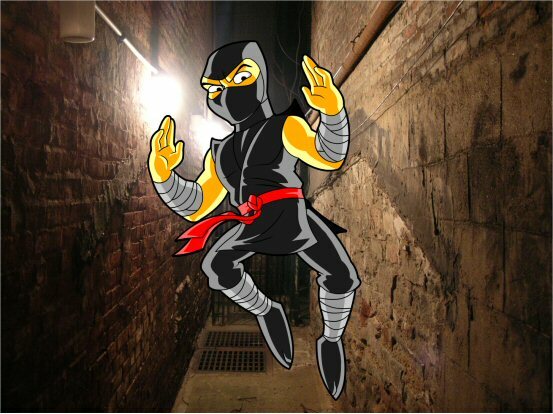 Now the ninja can strike anywhere! Once you get the hang of all that, you could even experiment with different colors. There are many unique ways you could color the highlights and shadows, giving it even more visual interest. And there you have it! Now you know how to make clean, bold, eye-catching cartoon characters on your computer! Have fun creating and experimenting! To see this all in action, check out this video creating a Punx style cartoon alien! UPDATE! Want revenge on those little green men? You can now download a vector version of the above alien to examine and experiment with yourself! Get it now at my Clip Art Hoard! UPDATE 2! The above ninja is also now posted at the Clip Art Hoard blog as well, so you can play around with that one too! Be sure the tools you're using are actually fun to create with and easy on your body! Vector graphics are a surefire way to get those smooth lines and crisp appearance! Keep yourself interested in your work by drawing things you are passionate about! Feel free to email me your questions, comments and creations, thanks!